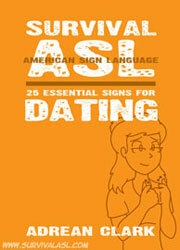 Survival ASL: 25 Essential Signs For Dating - NEW! This quick guide has 25 important American Sign Language words for your first date with a deaf signer! To purchase directly from the Apple iBookstore go here. For the Amazon Kindle edition, click here. To purchase the eBook in other formats, visit the Survival ASL: Dating Smashwords page. Coming soon to the Apple iBookstore and other online book retailers! This important guide provides 25 essential signs for children to start learning American Sign Language. It has been designed especially for the mobile format, so the signs are always ready at hand for you! 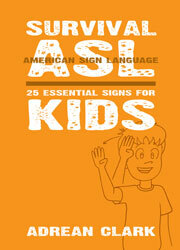 To purchase the eBook in other formats, visit the Survival ASL: Kids Smashwords page. "I am Deaf and teach Sign Language classes for hearing families. I find the signs accurate and appealing to the eye..." --Melissa Greenlee, review at Smashwords.com. Adrean Clark is also the author of 8 Ways to be Deaf and The Census Taker and Other Deaf Humor.